What’s the difference between Chipmunk’s Free, Plus, and Pro plans? With our Free plan, you can store up to 250 MB total and have up to 3 users. Our Plus plan adds 10 GB of storage per user and you can have up to 10 users. You’ll also have public access functionality, allowing external users to view and download your team’s content. Pay monthly and the cost is $15 per user, per month or save up to 20% with a yearly subscription that costs $12 per user, per month. Our Pro plan includes everything in Plus, increases the storage per user to 20 GB, and allows you to have up to 20 users. You'll also get priority support. Pay monthly and the cost is $29 per user, per month or save up to 17% with a yearly subscription that costs $24 per user, per month. 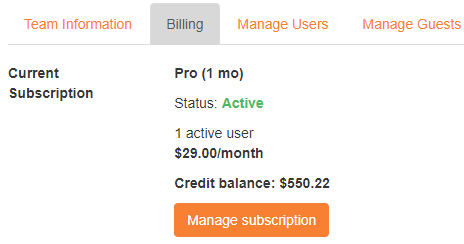 If you're on any of our Plus or Pro plans, you can view your current subscription by clicking on your name in the upper left corner, selecting Team Settings, and clicking on the Billing tab. Here, you can subscribe or switch plans at any time and you’ll automatically be credited or charged a prorated amount for any difference owed. For example, if you sign up for a yearly subscription to our Pro plan and later switch to Plus, we’ll credit you the unused portion of your original charge and apply future monthly charges to that balance first until it’s gone. The credit never expires, so if you switch to Free, that credit will remain until you’re ready to use it. What happens if I exceed the storage limit for my plan? You can manage your subscription by clicking on your name in the upper left corner, selecting Team Settings, and clicking on the Billing tab. Switching to our Plus plan adds 10 GB of storage per user and switching to Pro increases the storage per user to 20 GB. For both Plus and Pro plans, if you exceed your total included storage, we’ll automatically add additional storage to your plan at a rate of $5 per month per 50 GB. Click on your name in the upper left corner, select Team Settings from the menu, and click on the Manage Users tab. To remove a user from your team, find them in the list of users and click Deactivate. The user’s access will be revoked within 5 minutes and we’ll credit your account a prorated difference for the removed user for the remainder of the current subscription period. You can make updates to your subscription at any time—including downgrading your plan or reducing your total number of users—and a prorated credit will be issued automatically. The credit will automatically apply to any future subscription charges and doesn’t expire. While we’re happy to credit your account at any time if you change your mind about our Plus or Pro plans or just need to put it on hold for a while, we typically cannot offer cash refunds unless required by law. See our Terms and Conditions for more info. What if I need more than 20 users or custom features? We support custom payment options for Studio users; contact sales for more information. If we’ve applied a credit to your account due to downgrading your subscription or deactivating a user, the credit will automatically apply first the next time we charge you for your subscription. To view the credit available on your account, click on your name in the upper left corner, select Team Settings, and click on the Billing tab. Do you offer a self-hosted option? At this time, we do not offer self-hosting for our cloud plans but contact sales for more information on self-hosting for Studio plans.